There are lots of meta tags and html-tags for websites and obviously not all tags influence the search result. For example the html cookie tag doesn't have any role to rank your website or blog in search engine results, however the Title, Description and Keyword Tags are very important. We are come up with few tags which will help you to rank fast in SERP. We will not be discussing the tags, which are not much important. 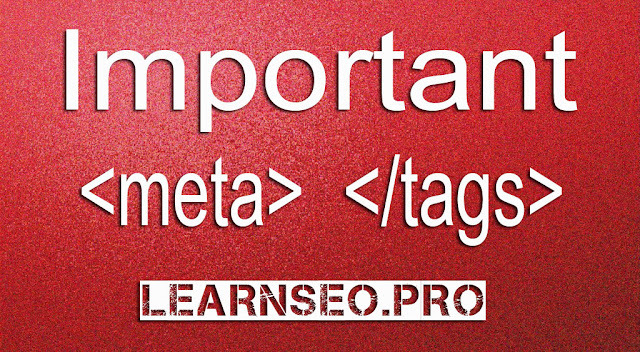 We will be sharing only The Most Important Meta Tags for all Websites for Better SEO. Title tag should not be more that 70 characters. Description tag should not be more than 155 characters. Incorrect Way: "Learn SEO, Learn SMO, Learn Online Marketing"
Correct way: "Learn, SEO, SMO, Online Marketing"
The only thing he says is : "Google does not use the keywords meta tag in web ranking". That's it! All the other information is made up by so called experts. The spider will crawl every page. The spider will not crawl any page. Tell spiders to come back and index your website again. You can change 7 days to any amount. It is up to your choice. Rel-canonical tag is incredibly important, but is only needed when you have duplicate content issues or you’re looking to move the link equity from one page to another. The Most Important Meta Tags for all Websites for Better SEO and Search Engine results.